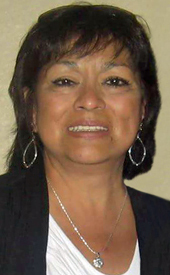 Services are scheduled for 9:30 a.m. Wednesday at Our Lady of Grace Catholic Church for Theresa Valenzuela Cardenas of Artesia. Cardenas, 59, passed away Friday, Jan. 20, 2017, at her home. Fr. Martin Cornejo will officiate at the services, with interment to follow at Twin Oaks Memorial Park. Pallbearers will be Alijah Gomez, Ryan Gomez, Benny Guzman, Tony Baca, Justin Guzman, Terrence Baker, Gary Lopez and Emilio Fernandez. Honorary pallbearers are all of her godchildren. A rosary will be recited at 6:30 p.m. Tuesday at Our Lady of Grace. Theresa was born July 15, 1957, in Artesia, the daughter of Ruben and Amelia (Vargas) Valenzuela. She was a lifelong Artesia resident. On Nov. 3, 1975, she married Richard Cardenas in Carlsbad. Theresa was a homemaker and a member of Our Lady of Grace Catholic Church, the Moose Lodge, and the San Jose Society. She enjoyed casinos, yard sales, cooking and entertaining. Her grandchildren were her favorite hobby. Survivors include her husband, Richard Cardenas, of Artesia; son Richard Ray Cardenas of Albuquerque; daughter Amy Gomez of Carlsbad; sisters Corrine Guzman and Melissa Fernandez, both of Artesia, and Sylvia Baker of Albuquerque; and grandchildren Alijah Gomez, Ryan Gomez, Drew Gomez and Carolina Cardenas. She was preceded in death by her parents and brother Ruben Valenzuela Jr.